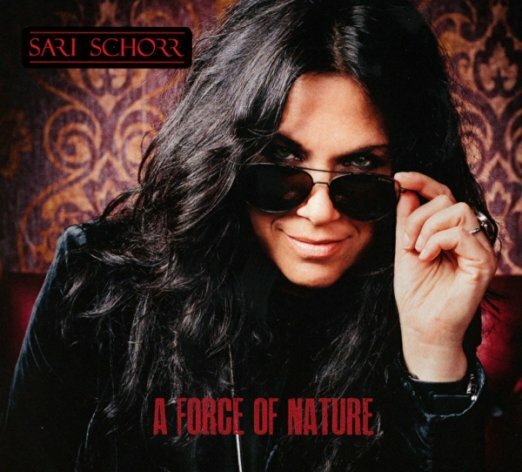 I just received the newest release, A Force of Nature, from Sari Schorr and it's interesting. Opening with Ain't Got No Money, a slinky rocker, Schorr has the lead on vocal and is nicely backed by Innes Sibun and Quique Bonal on guitar, Julian Maeso on keyboards, Nani Conde on bass, Jose Mena on drums and Mike Vernon on percussion. Bouncy rocker, Aunt Hazel has a light country flair. Schorr's vocals are powerful and interesting guitar blending gives the track nice texture. Ballad, Damn The Reason, is nicely supported by Maeso's organ work and Oli Brown steps up with lightning flash guitar riffs. Sassy, Cat and Mouse, shows a different dimension in Schorr's vocals, with a cool funk beat under the track and slick guitar riffs over the top. Ledbelly's Black Betty gets a real nice remake hugging tight to early blues roots but kicking it in a whole new heavy rock style. Very nice! Walter Trout's Work No More features Walter Trout's soaring guitar riffs over a real solid bottom bass line and piano by Dave Keyes. One of the hottest tracks on the release, Trout really lights it up. Demolition Man has an easy shuffle pace, showcasing Schorr's vocals and finds Sibun trading riffs with Maeso. Cool. Oklahoma has a smooth jazzy feel and Schorr's vocals work nicely in this arena. Brown is back with cool ringing chords and nicely articulated lead work. Ballad, Letting Go, showcases the richness of Schoor's vocal style with Jesus Lavillas on keys. Sibun steps up with a really soulful guitar solo on this track making it one of my favorite originals on the release. My absolute favorite track on the release is a soulful take on HDH's Stop! In The Name Of Love, made popular by The Supremes. This is an excellent track and an excellent interpretation that would commonly go unnoticed as a cover. Unquestionably the best track on the release, it features soulful vocals, strong guitar work and solid backing vocals by Rietta Austin. Excellent! Wrapping the release is Ordinary Life, a simple vocal ballad accompanied by piano. Quiet and subtle, a very nice closer for a solid release.